-21P Scart plug to plug. -High speed and clear image. -Competitive price and excellent quality. Brief: -High quality and reasonable price. *High speed and clear image. *Competitive price and excellent quality. *High quality audio & video cable . 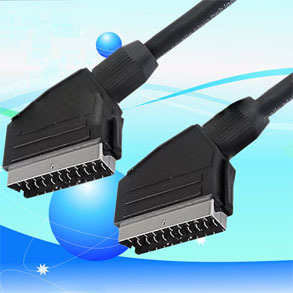 *Audio Video cable, molded scart plug to scart cable . *Scart cable with connectors for audio/video connection and extension. *Shielding: Braid or unbraid , based on your request. *Inner conductor: Bare copper, tin copper , copper clad steel or CCA ,CCS. *Braiding material:According to your request. *Jacket: Flame retardant PVC jacket , according to your requirement. *21 pin SCART plug to plug ,which is high quality and RoHS compliant. *Suitable for connecting LCD player, video recorder or other device that has a SCART socket to your TV that has a composite video and audio inputs on Phono(BNC and RCA) sockets. *Often TV will have a third AV input on the front or side unit and so this lead will be ideal if you have run out SCART sockets. * Inner packing: 1pc in a PE bag ,blister packing. * Outer packing: carton box. * Also base on your request. We are specialized in cables and we have been in this line of business more than 7years,offering you high quality products with no difficulty.We will give you first-class service like high quality products and prompt delivery. Male/Female/flat or angled;Metal or plastic connector;Gold or nickel;w/1 core,w/2 cores...are available.